Bathhouse Grounds and Environs – The Emerald Stairs, The Mausoleum of Tastan the Warlord, Ruins Inhabited by Cannibalistic Beggars etc. 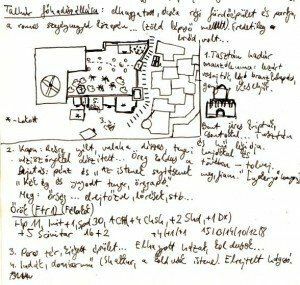 Design notes: The tomb of Ardaxas was first published in a Hungarian gaming magazine named Fanfár in 2003. Although I immediately translated it into English, it was put aside with the upcoming Kauran supplement in mind: with slight changes (removing the original context of entering the Undercity), it finally saw the light in 2005 under the title Below the City. If people read the module with its “touch with extreme care” traps, the demi-lich in the final room, the linearity in its design and the hints to extreme antiquity, they may think Below the City was created in the mould of The Tomb of Horrors. Almost, but not quite: the exact source of inspiration is not the AD&D tournament scenario, but the first mission in Calendra’s Legacy, a masterful (and I would say definitive) trilogy of fan missions for Thief 2 the computer game. Arkhyn’s tomb, a side-mission in an otherwise rather peaceful level, is author Anthony Huso’s homage to The Tomb of Horrors; Below the City, therefore, is a homage to a homage while it also incorporates a few ideas from The Vigil, a different mission by Jussi Lehtinen (notably the tomb’s fourfold entrance puzzle). 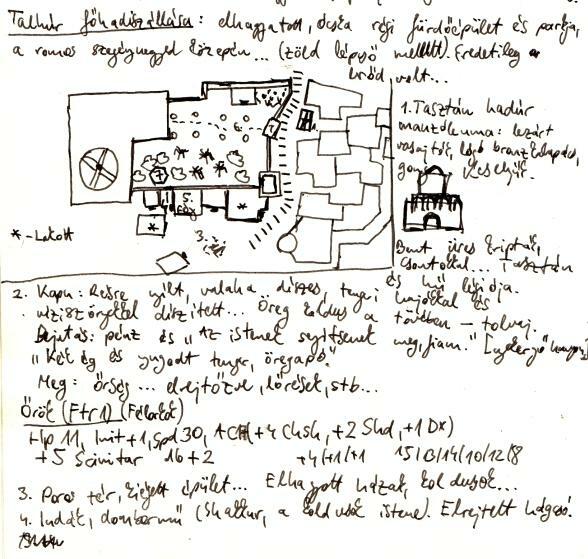 In design, the scenario is significantly more forgiving than Gygax’s masterpiece: although the traps are deadly, there are clearly identified clues for all but the final room, and a group of expert puzzle-solvers would probably plow through the lot without a hassle (this does not even take into account augury spells, which any cleric worth his price should keep as many copies of as possible). As it was, a fight with animated statues that broke magic weapons destroyed a lot of the party’s wealth, who finally decided to take their losses and forget about the place when Brantar, a long-surviving and much beloved cleric character (who had been to, and survived expeditions into The Tomb of Abysthor and Rappan Athuk – no small thing) was ignominiously flattened by a crushing block trap after making a wrong step. 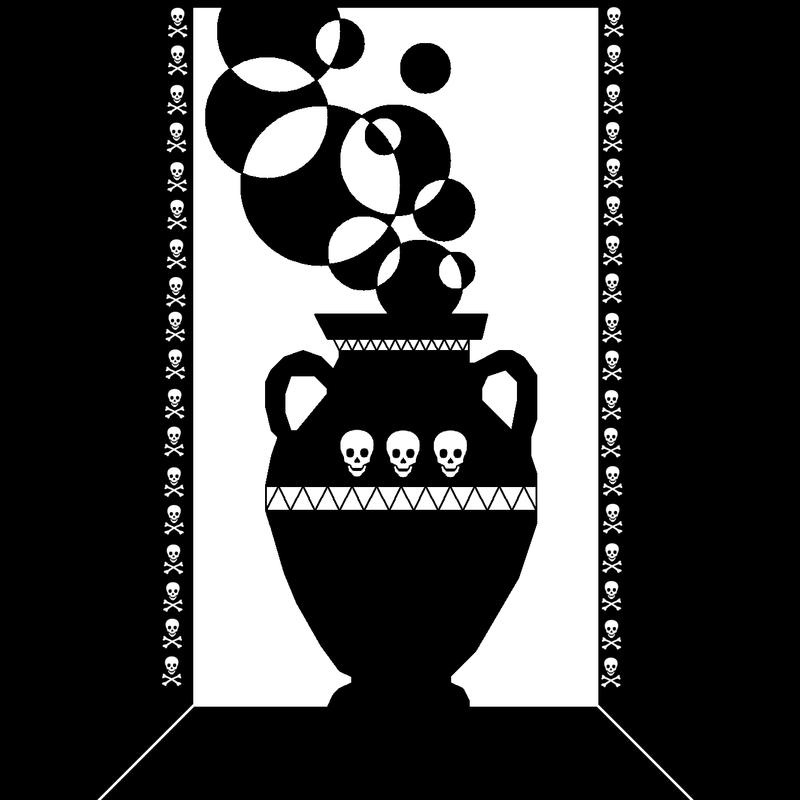 The interesting thing about the encounter with the demi-lich at the end is that a lot like The Tomb of Horrors, it is best handled by staying away from combat: Ardaxas is an extremely deadly opponent with special immunities, but he can be bargained with, and may offer the party better things than treasure – becoming an oracle or even a patron. This course of action may be completely counterintuitive to someone whose gaming experiences were based on the heroic fantasy tradition; to our group, veterans in backstabbing and making questionable moral decisions (Brantar himself had previously saved his life from the Skeleton King Saracek by agreeing to convert to evil, a decision that haunted him until he could get his original good alignment back), it would have been self-explanatory. The House of Thieves in its complete, unreleased form is probably also worthy of discussion to draw attention to the differences between a document intended for home use and a released module. As written, the 20-page manuscript presents a completely linear adventure, where heavy assumptions are made about the characters accepting adventure hooks and behaving in certain ways. If released without changes, the material would justifiably face accusations of severe railroading. And here is the difference: these assumptions were not only made on the basis of knowing the players after years of play, but also on the understanding that any action that got the party off track would immediately transform a linear adventure into a sandbox scenario: a collection of locales, NPCs, agendas and potential encounters which, shifting into a different pattern like a kaleidoscope, could still be used piecemeal for slightly different purposes (and of course abandoned if everything went off the tracks). This, however, assumes the Gamemaster’s willingness to adapt to changed circumstances; even among people who know better, the power of written words is so high that they introduce dangerous mental blocks which could make the difference between a great and an abysmal experience at the table. Therefore, The House of Thieves as a complete, published scenario is probably left unexplored, while its component parts could become valuable pieces in another game’s puzzle.